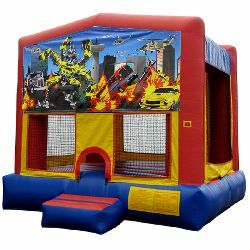 The Robo Car is our best choice for a Transformers bounce house rental. Transform your party from wow to WOW with this popular movie theme. Scene shows transformed robot wreaking havoc on urban city.